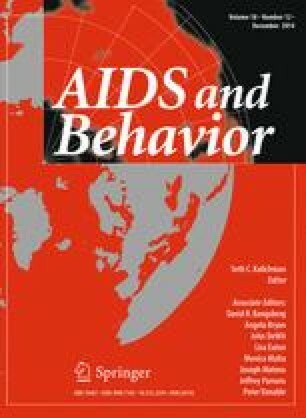 African American/Black and Hispanic persons living with HIV/AIDS (“AABH-PLHA”) are under-represented in HIV/AIDS medical studies (HAMS). This paper evaluates the efficacy of a social/behavioral intervention to increase rates of screening for and enrollment into HAMS in these populations. Participants (N = 540) were enrolled into a cluster randomized controlled trial of an intervention designed to overcome multi-level barriers to HAMS. Primary endpoints were rates of screening for and enrollment into therapeutic/treatment-oriented and observational studies. Intervention arm participants were 30 times more likely to be screened than controls (49.3 % vs. 3.7 %; p < .001). Half (55.5 %) of those screened were eligible for HAMS, primarily observational studies. Nine out of ten found eligible enrolled (91.7 %), almost all into observational studies (95.2 %), compared to no enrollments among controls. Achieving appropriate representation of AABH-PLHA in HAMS necessitates modification of study inclusion criteria to increase the proportion found eligible for therapeutic HAMS, in addition to social/behavioral interventions. This study was supported by a Grant from the National Institute of Allergy and Infectious Diseases (R01AI070005) and the Center for Drug Use and HIV Research (P30DA011041) at the New York University College of Nursing. The project is dedicated to the memory of Keith Cylar, MSW, Co-founder and Co-chief Executive Officer of Housing Works, Inc. We would like to thank the men and women who participated in the study, Amy Braksmajer, Ph.D. and Christopher Hilliard, MPH for editorial assistance, Dr. Usha Sharma, the study’s Program Officer, and members of the ACT2 Collaborative Research Team: Michael Aguirre, Noreen Boadi, MA, DeShannon Bowens, MA, Patricia Chang, MA, Gwen Costantini, FNP-C, Rebecca de Guzman, Ph.D., Ann Marshak, Sondra Middleton, PA-C, Corinne Munoz-Plaza, MPH, Maya Tharaken, MSSW, Robert Quiles, and Mougeh Yasai, MA. National Institute of Allergy and Infectious Diseases [NIAID]. HIV infection in minority populations 2008. http://www.niaid.nih.gov/topics/HIVAIDS/Understanding/PopulationSpecificInformation/Pages/minorityPopulations.aspx. Accessed 31 July 2013.